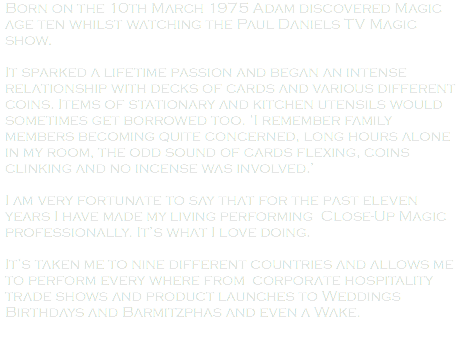 Born on the 10th March 1975 Adam discovered Magic age ten whilst watching the Paul Daniels TV Magic show. I am very fortunate to say that for the past eleven years I have made my living performing Close-Up Magic professionally. It’s what I love doing. It’s taken me to nine different countries and allows me to perform every where from corporate hospitality trade shows and product launches to Weddings Birthdays and Barmitzphas and even a Wake.